Exclusive content, an original soundtrack, and an entire DC Animated movie are only part of the goodies in the Collector's Edition. When Batman: Arkham Asylum came out, its Collector's Edition was underwhelming at best (seriously, remember that junky plastic batarang?). Now that Batman: Arkham City's release is fast approaching, Warner Bros. Interactive has revealed the game's planned Collector's Edition sounds like it's going to give players a lot more bang for their buck. Batman: Gotham Night is a surprising addition to the bundle, but it's not an unwelcome one. 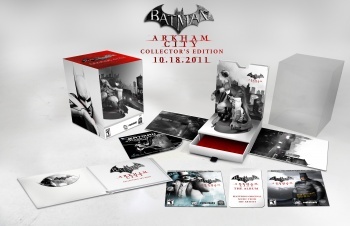 The Collector's Edition of Batman: Arkham City isn't listed on Amazon yet, but expect that to change soon.